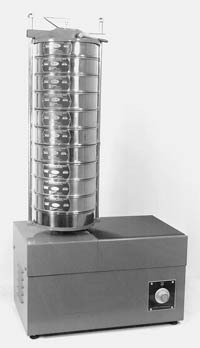 There are two models of Ro-Tap Sieve™ Shakers available. One is for 8 in sieves, P-231, and the other for 12 in sieves, P-240. Both provide a circular and tapping motion that closely emulates hand sieving. 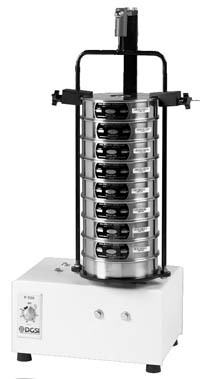 The P-231 is designed for shaking up to 6 full height 8 in sieves with pan and cover. 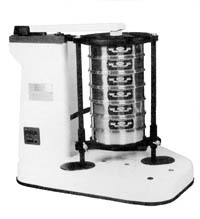 The P-240 is for 3, 12 in sieves with pan and cover. 220 volt 50 Hz models are also available. 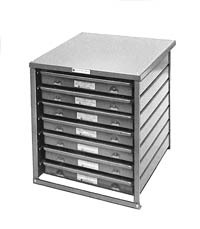 Rugged all steel construction features a vertically mounted and enclosed 1/4 HP motor and 30 minute timer. 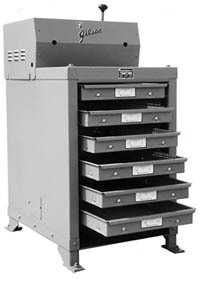 The machine may be easily fastened to a work top for added stability. Overall size 28 in W x 21 in D x 25 in H (71.1 x 53.3 x 63.5 cm).